“Mobile” is a tricky topic, if for no other reason than the fact that tablets are mobile devices and smartphones are mobile devices. And, when it comes to web sites, even ones that have brilliantly adaptive/responsive designs, the user experience (and, often, the user’s intent) can vary quite a bit depending on whether they’re visiting the site from their phone or from a tablet. 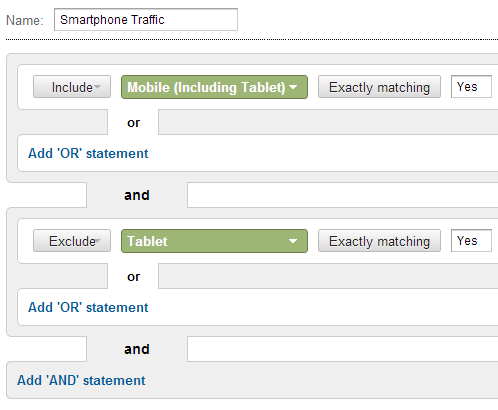 That’s the first question I tackled in my most recent Practical eCommerce article, Analyzing Mobile Traffic in Google Analytics; 5 Questions. Create it yourself, or, if you want it pre-created, you can get it at http://bit.ly/ga_phone. 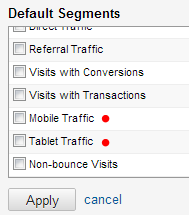 Just like how you want to compare Phone traffic to Desktop traffic, but “All Visits” includes both!